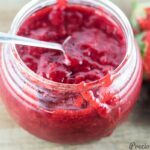 The point of this healthy strawberry jam is to show you that you can totally make jam without sugar. So even if you don’t have strawberries around you, grab any other fruit around you and let’s make some healthy jam. 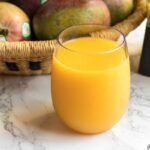 Mango or pineapple will work well here. This strawberry jam is sweetened with honey and to tell you the truth, I can’t tell the difference between this jam and jam made with sugar. 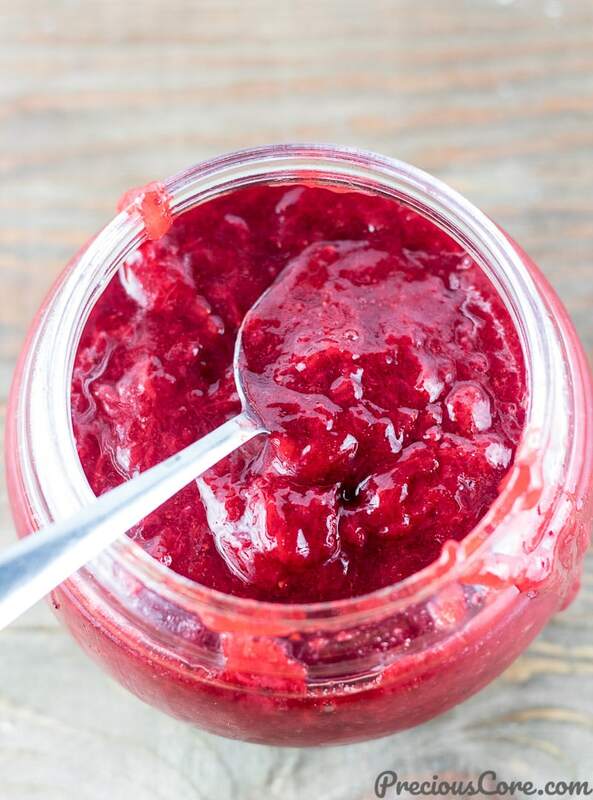 It is sweet, fruity with a gel-like consistency, just like a jam should be. And oh, it is also made without pectin. 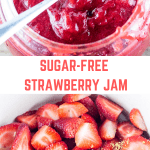 So sugar-free healthy jam for the win! You guys, 14 days! That’s how long a carbaholic like me has stayed without baking/eating bread or anything with regular white flour. Neither have I tasted white rice or eaten any sugar. Has it been easy? No! But let me tell you this: I feel great! I enjoy detoxing my body like this every now and then. I have experimented with all sorts of healthier alternatives to my traditional diet. I have baked with oats, made waffles out of plantains and eaten vegetable salads more times than I can count. These 14 days have taught me a lot. One is that a life without refined sugar is totally possible. 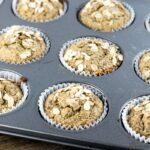 Another is that you can totally get kids to enjoy healthy food that is non-traditional, My girls have totally loved the unconventional meals. And one of their favorite things has been this healthy strawberry jam which has been a good friend on the breakfast table. At first, I was skeptical about trying to make jam without sugar. Will the consistency be right? Will it taste good? Will the taste of honey not overpower it? Ha. But when I made this jam, I found myself eating the warm jam right out of the pot with a spoon. 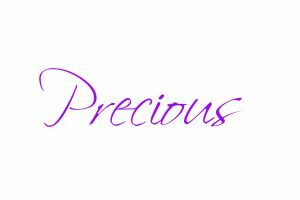 It is sufficiently sweet. The honey taste is not overpowering at all. In fact, you will think it is regular jam made with sugar. Winner! Besides, I just had to make something with strawberries because my local grocery store had strawberries for only $1 per pound. So I grabbed a good quantity to take home with me. To make the jam, you need strawberries, honey and 1 lemon. 3 simple ingredients and jam will be yours! 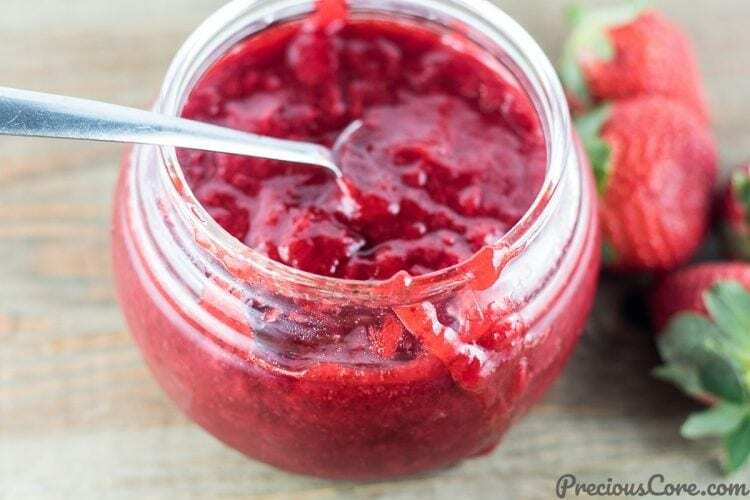 If you are looking for a regular jam recipe with sugar, click here. 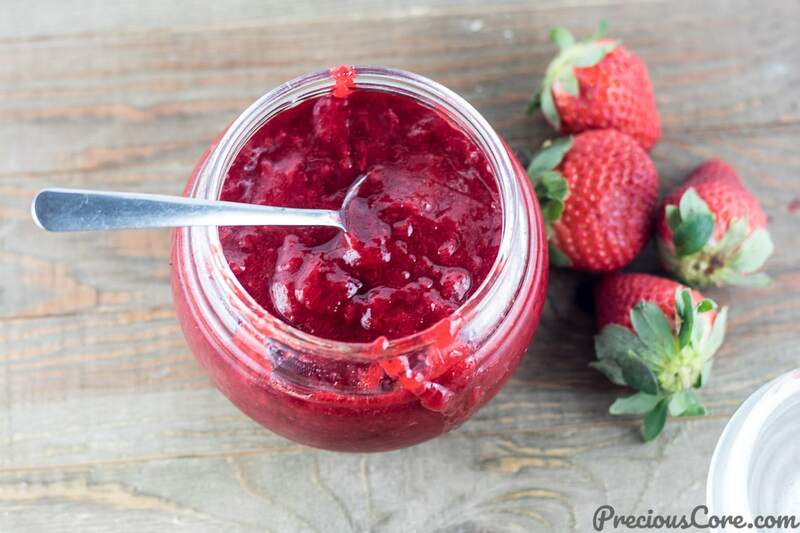 This healthy strawberry jam doesn't taste healthy at all. It is sweet, fruity with a gel-like consistency like a jam should be. It is made without pectin or sugar. Enjoy at your breakfast table with bread, pancakes and more. Rinse the strawberries well then chop off the top part with the leaves. Cut the strawberries into halves or quarters. Place them in a pot. Add in the honey, lemon zest and lemon juice. Toss to combine. Place the pot on medium heat and cook covered for 10 minutes. Open the pot and using the back of a wooden spoon or a potato masher, mash the strawberries to break them down a little. Let them cook for another 10 minutes while you stir from time to time. Place in a glass jar to cool then store in the fridge. 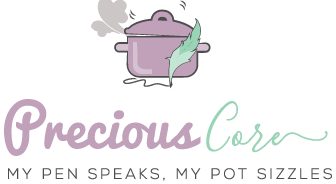 Enjoy on pancakes, muffins, crepes, bread and more! Wow!! This is amazing, I remember my mom making jam with pectin and sugar!! I did not know you could make this without pectin. Funny I bought 3 pounds of strawberries cos they were only a pound. Looks like strawberries are cheap now. Please try this version without pectin or sugar and you will be amazed. How long does this jam last before it goes bad? Like a week or two? We kept it in the fridge for about 2 weeks and it still tasted perfect. However, if you seal it in sterilized mason jars, it could last for months on the countertop! 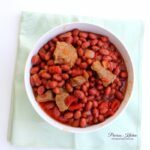 Can one freeze this recipe? Hi Jenni, yes you can! 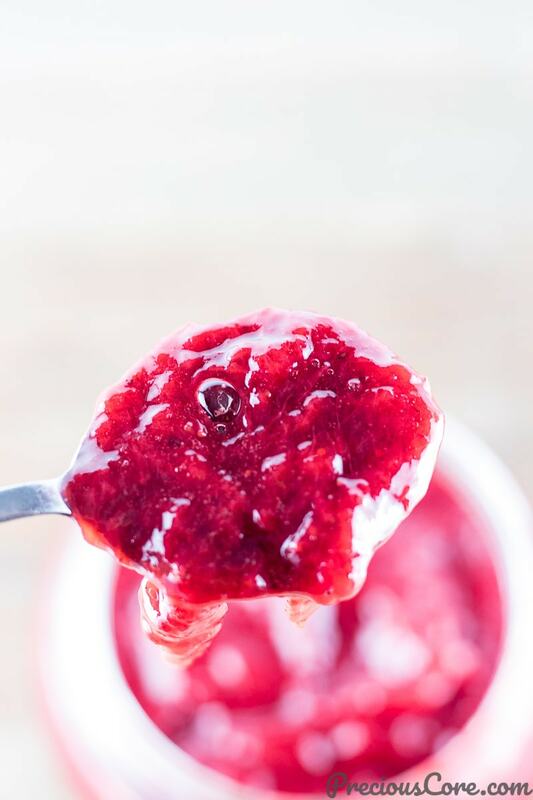 Hi Emily, you could use an immersion blender to blitz the stawberries until smooth – do this after the jam starts to cook. Hope this helps. How could i do this with raspberries? Hi Tina, I’m sure that will work though I’ve never tried with raspberries. Hi Amy, yes it is supposed to be runny while cooking. It is going to go from being runny to having a jam-like consistency. Please let me know how it goes. It’s a thick strawberry sauce. I added chia seeds in the hope it’d thicken a bit more but no luck. Oh no! Maybe you didn’t cook it long enough. It’s supposed to go from sauce to jam. Also, try mashing the strawberries once they are soft and bubbly with a potato masher or with a wooden spoon next time. Please let me know how it goes. Can I use frozen strawberries to make it? Hi McKenzie, I have never made it with frozen stawberries but you sure can. CAN ORANGE BE USED TO MAKE JAM? I’m sure it can but I’ve never tried it. This was absolutely delicious. The taste was in between a jam and the strawberry topping for ice cream. Mine came out very liquidy. I did follow the recipe exactly. I’m going to try again but with blueberries this time. If still runny, I’ll add chia seeds and refrigerate overnight. 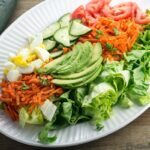 Thank you for this wonderful healthy recipe. Hi Lisa, thank you for the review! Strange that yours came out liquidy. You could try letting it cook for another 5 minutes or so until it thickens. Chia seeds are also a great idea. Have a great weekend!